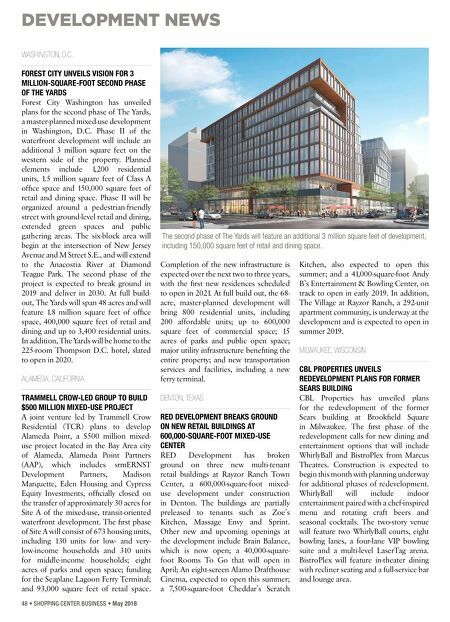 DEVELOPMENT NEWS 48 • SHOPPING CENTER BUSINESS • May 2018 WASHINGTON, D.C. FOREST CITY UNVEILS VISION FOR 3 MILLION-SQUARE-FOOT SECOND PHASE OF THE YARDS Forest City Washington has unveiled plans for the second phase of The Yards, a master-planned mixed-use development in Washington, D.C. Phase II of the waterfront development will include an additional 3 million square feet on the western side of the property. Planned elements include 1,200 residential units, 1.5 million square feet of Class A office space and 150,000 square feet of retail and dining space. Phase II will be organized around a pedestrian-friendly street with ground-level retail and dining, extended green spaces and public gathering areas. The six-block area will begin at the intersection of New Jersey Avenue and M Street S.E., and will extend to the Anacostia River at Diamond Teague Park. The second phase of the project is expected to break ground in 2019 and deliver in 2030. At full build- out, The Yards will span 48 acres and will feature 1.8 million square feet of office space, 400,000 square feet of retail and dining and up to 3,400 residential units. In addition, The Yards will be home to the 225-room Thompson D.C. hotel, slated to open in 2020. ALAMEDA, CALIFORNIA TRAMMELL CROW-LED GROUP TO BUILD $500 MILLION MIXED-USE PROJECT A joint venture led by Trammell Crow Residential (TCR) plans to develop Alameda Point, a $500 million mixed- use project located in the Bay Area city of Alameda. Alameda Point Partners (AAP), which includes srmERNST Development Partners, Madison Marquette, Eden Housing and Cypress Equity Investments, officially closed on the transfer of approximately 30 acres for Site A of the mixed-use, transit-oriented waterfront development. The first phase of Site A will consist of 673 housing units, including 130 units for low- and very- low-income households and 310 units for middle-income households; eight acres of parks and open space; funding for the Seaplane Lagoon Ferry Terminal; and 93,000 square feet of retail space. Completion of the new infrastructure is expected over the next two to three years, with the first new residences scheduled to open in 2021. At full build out, the 68- acre, master-planned development will bring 800 residential units, including 200 affordable units; up to 600,000 square feet of commercial space; 15 acres of parks and public open space; major utility infrastructure benefiting the entire property; and new transportation services and facilities, including a new ferry terminal. DENTON, TEXAS RED DEVELOPMENT BREAKS GROUND ON NEW RETAIL BUILDINGS AT 600,000-SQUARE-FOOT MIXED-USE CENTER RED Development has broken ground on three new multi-tenant retail buildings at Rayzor Ranch Town Center, a 600,000-square-foot mixed- use development under construction in Denton. 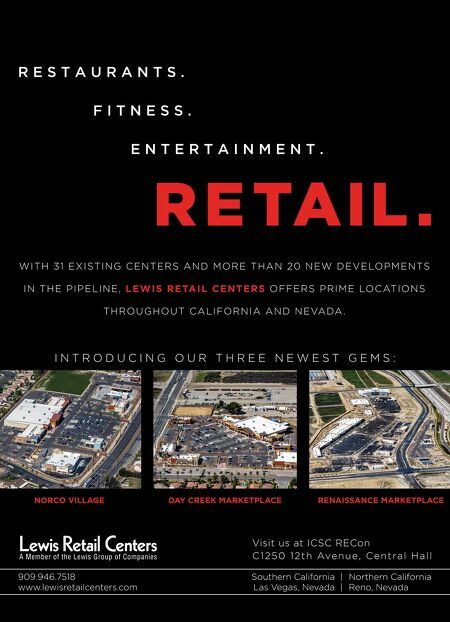 The buildings are partially preleased to tenants such as Zoe's Kitchen, Massage Envy and Sprint. Other new and upcoming openings at the development include Brain Balance, which is now open; a 40,000-square- foot Rooms To Go that will open in April; An eight-screen Alamo Drafthouse Cinema, expected to open this summer; a 7,500-square-foot Cheddar's Scratch Kitchen, also expected to open this summer; and a 41,000-square-foot Andy B's Entertainment & Bowling Center, on track to open in early 2019. In addition, The Village at Rayzor Ranch, a 292-unit apartment community, is underway at the development and is expected to open in summer 2019. MILWAUKEE, WISCONSIN CBL PROPERTIES UNVEILS REDEVELOPMENT PLANS FOR FORMER SEARS BUILDING CBL Properties has unveiled plans for the redevelopment of the former Sears building at Brookfield Square in Milwaukee. The first phase of the redevelopment calls for new dining and entertainment options that will include WhirlyBall and BistroPlex from Marcus Theatres. Construction is expected to begin this month with planning underway for additional phases of redevelopment. WhirlyBall will include indoor entertainment paired with a chef-inspired menu and rotating craft beers and seasonal cocktails. The two-story venue will feature two WhirlyBall courts, eight bowling lanes, a four-lane VIP bowling suite and a multi-level LaserTag arena. BistroPlex will feature in-theater dining with recliner seating and a full-service bar and lounge area. The second phase of The Yards will feature an additional 3 million square feet of development, including 150,000 square feet of retail and dining space.